FHCA Executive Director highlights where long term care providers stand with just one week left in the 2013 legislative session. The budget, tort reform and Certificate of Need legislation are discussed. We are forever hopeful that when it comes to reporting accurately and without malice, members of the press hold themselves to a pretty high standard. Unfortunately, @JoshSalman's recent column aspires to create sensationalism without the benefit of accuracy or fairness. Senate Bill 1384 is another attempt by Florida leaders, this time spearheaded by Senator Bill Galvano, to ensure we continue holding our nursing homes to the highest standards while protecting our system of justice against selfishness, greed and harm. Had he done his homework, Mr. Salman would have learned that Senate Bill 1384 does nothing to weaken regulations and protections, but it does draw a line against the kind of legal mischief that’s enriched personal injury attorneys while depriving nursing homes of resources devoted to the care of our loved ones. The truth is Florida nursing homes have some of the strongest oversight in the country, with facilities undergoing an intense survey process, mandated minimum staffing ratios and increasing regulations at the state and federal level. Standards here are consistently rated among the nation’s best. Federal regulators give over 50 percent of Florida nursing homes a four or five star rating, and facilities continue to staff well above the national average. Individuals are receiving more time with nurses on a daily basis, which is important given the changing health needs of today’s resident. Customer satisfaction remains high among long-stay residents and their families, and short-stay patients’ satisfaction has significantly improved in recent years. Mr. Salman and others in the press continue to cite a malcontent former state employee as their source for commentary on this legislation. Actual research on the “advocacy group” Families for Better Care shows how this organization and its spokesperson are connected to trial attorneys. Further, according to public records, trial attorneys donated more than $8 million in campaign contributions during the 2012 election cycle. And speaking of lawsuits, Mr. Salman failed to point out that Mr. Lee himself has filed suit for personal damages against the trade associations representing Florida’s long term care facilities, casting his objectivism even further into doubt and his motives even further into question. Many nursing home lawsuits have nothing to do with seeking redress for real negligence or even with improving conditions for residents. Because all citations must be reported, even those that are later proven to be unfounded, the data is easily exploited to prey on the emotions of seniors and their families in order to seek clients for litigations. Every industry can and should be held accountable, and this legislation does nothing to change that. Senate Bill 1384 allows patients to sue for negligence and damages for those who purposely or consciously harm our seniors. Regarding claims for punitive damages, the bill ensures such claims are based on evidence, not hearsay, and are driven by the merits of the case, not by a personal injury lawyer’s attempted push to enrich himself with someone else’s bank account. The unfortunate reality is that punitive damages, when awarded for serious and egregious behavior, go mostly to others, NOT to the plaintiff. Those lawyers who specialize in suing nursing homes oppose this legislation because it removes their ability to generate higher out-of-court settlements and squeeze out more dollars for their fees. Florida is one of the worst states in the nation for lawsuits, and trying to extort money from businesses using the courts is an all-too-common practice in our increasingly litigious society. The cost to nursing home care from frivolous or malicious suits driven by personal injury lawyers is draining resources that go directly to those responsible for delivering that care – doctors, nurses, therapists and others who have dedicated their lives to helping others. When trial lawyers profit at the expense of others, and support policies that help themselves more than those they represent, it’s not legal representation – it’s larceny. Let’s set the record straight – personal injury lawyers and their pseudo-advocates do nothing to improve quality. Quality is good because our state’s nursing homes are committed to an environment where the highest standard of care is the norm. Senate Bill 1384 is a long-overdue remedy, and Senator Galvano’s leadership through this bill will simply restore some common sense, fairness, and respect for the law. 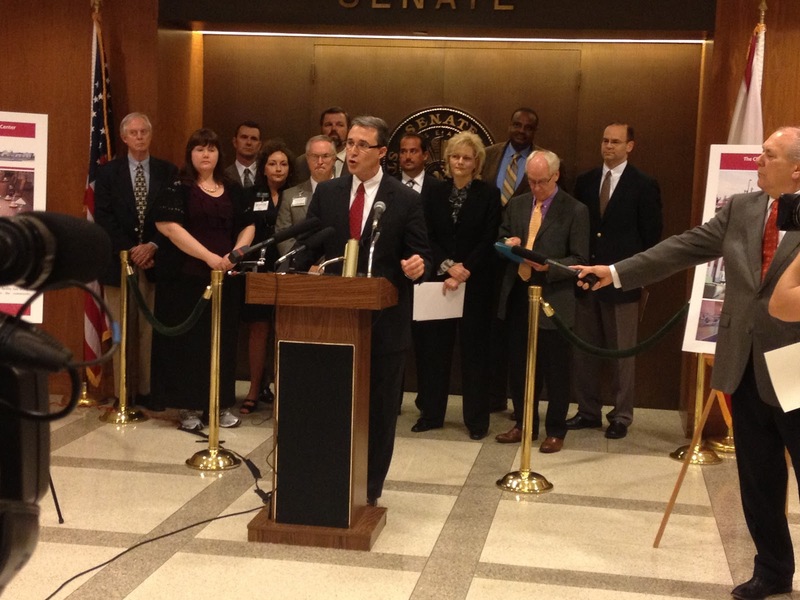 Watch highlights from the Certificate of Need issue press conference, progress of nursing home tort reform and FHCA's last Lobby Wednesday, which featured over 150 members from Gulf Coast Health Care, Page Healthcare, Southern Healthcare Management, Life Care Center of Estero, FHCA District III, Valencia Hills Health & Rehab, associate members and other LTC advocates. Special thanks to PharmScript for sponsoring our Lobby Wednesdays throughout the 2013 legislative session. CS/SB 1384, the nursing home tort reform bill sponsored by Sen. Bill Galvano (R-26), passed favorably out of the Senate Health Policy Committee this week. This bill clarifies guidance in due process in determining whether evidence exists that would warrant a claim for punitive damages. SB 1384 will not take away the ability for someone with a legitimate case to have their day in court or reasonable compensation if their case has merit. Nursing home care is one of the most heavily regulated sectors in Florida, and this bill does not weaken those regulations or detract from ensuring facilities meet appropriate care standards. Facilities still undergo an intense survey process, still have to meet minimum staffing ratios along with increasing regulations at the state and federal levels. Facilities are committed to continued quality improvements and today, over 50 percent of Florida nursing homes showing a four or five star rating according to the Centers for Medicare and Medicaid Services. An appropriate system of justice should be based on liability, not making it lucrative for attorneys to file lawsuits. Reckless accusations by trial lawyers divert valuable time, attention and resources away and tarnish the reputation of trusted, high-quality facilities, and they drive up the costs for residents, facilities and ultimately, taxpayers. Please continue contacting your legislators to ask them to support this good bill which would help keep predatory trial attorneys from using punitive damages to inflate the cost of settlements in nursing home claims. Click here to enter your zip code and send an e-mail to your Senator today to ask them to support nursing home tort reform. Watch video of today's press conference with Sen. Rene Garcia, Florida Health Care Association representatives, AARP, Florida Council on Aging, Florida Conference of Catholic Bishops and other long term care advocates joining together to discuss opposition to SB 1482 by Sen. Alan Hays/HB 1159 by Rep. Marlene O’Toole which would create a special exemption that would allow nursing homes to be built in special deed-restricted communities, such as the Villages, bypassing state rules and a Certificate of Need moratorium on new nursing home beds. Sen. René Garcia (R-38) gathered with long term care advocates today to highlight the importance of a comprehensive, organized approach to health care planning for Florida’s seniors. Current legislation being considered (SB 1482 by Sen. Alan Hays/HB 1159 by Rep. Marlene O’Toole) would create a special exemption that would allow nursing homes to be built in special deed-restricted communities, such as the Villages, bypassing state rules and a Certificate of Need (CON) moratorium on new nursing home beds. 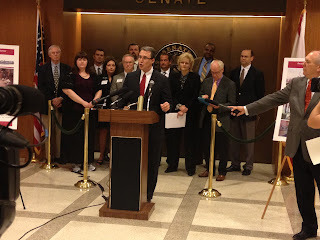 Florida Health Care Association, AARP, Florida Council on Aging, Florida Conference of Catholic Bishops and other long term care advocates joined together to oppose Senate Bill 1482 which is on Monday’s agenda in the Senate Judiciary Committee. Steve Bogomilsky, managing operator of Southern SNF Management, spoke about his recent ability to use the current CON process to move underutilized nursing home beds from other communities to build a state-of-the art 120-bed skilled nursing facility that services the Villages. The Villages Rehabilitation and Nursing Center opened last month and offers short-term rehab and longer, skilled nursing care. The facility is one of two skilled nursing centers that have opened within the last year which service citizens of the Villages and the surrounding counties. Jack McRay, Manager of Advocacy for AARP Florida noted that AARP opposes legislation that would create special “exemptions” to the moratorium. “Let’s not distort the long-term-care market by saddling it and Florida’s seniors with unnecessary nursing home beds and too few home-and-community-based resources and services,” said McRay. The Legislature created a Certificate of Need moratorium on nursing homes in 2001 as a way to control Medicaid costs, encourage home and community-based services and ensure the optimum use of nursing home care based on the need and demand for these types of services. The moratorium is currently set to expire in 2016 or when the Statewide Managed Care Long Term Care program is fully implemented, which is expected by early 2014. Sen. René Garcia (R-38) will host a press conference today, April 15, at 11:30 a.m. in the Senate 4th Floor Rotunda to highlight the importance of a comprehensive, organized approach to health care planning for Florida’s seniors. Current legislation (SB 1482 by Sen. Alan Hays/HB 1159 by Rep. Marlene O’Toole) would create a special exemption that would allow nursing homes to be built in special deed-restricted communities, such as the Villages, bypassing state rules and a Certificate of Need moratorium on new nursing home beds. Florida Health Care Association, AARP, Florida Council on Aging, Florida Catholic Conference and other long term care advocates will join together to discuss opposition to Senate Bill 1482 which is on Monday’s agenda in the Senate Judiciary Committee . Florida Health Care Association and nursing home providers directly impacted by this legislation will discuss how the current CON process is working, with beds underutilized in communities being moved to those areas where there is a need for nursing home services. Representatives from AARP will discuss the importance of taking seniors’ desire for home and community-based care into consideration when planning for a community’s needs for long term health care services. For details on the press conference, contact Kristen Knapp at kknapp@fhca.org or (850) 510.4389. Members from Cypress Health Group and facilities represented by Airamid Health Services met with their lawmakers and advocated for restored Medicaid funding and the passage of tort reform. Hear about the important messages they're delivering and catch interviews with Reps. Jimmy Patronis (R-6) and Betty Reed (D-61) on the importance of meeting with their constituents, especially those who care for our state's seniors. On April 10, 2013, President Obama released his FY 2014 budget request. By law, the President is supposed to send the budget to Congress no later than the first Monday in February. However, the Administration delayed the release of the FY 2104 budget because of the uncertainty surrounding the final FY 2013 spending bills and the impact of sequestration. The Budget Message of the President, information on the President’s priorities, budget overviews organized by agency (including the Department of Veterans Affairs), and summary tables can be found here. The VA 2014 Budget request for 2014 is $152.7 billion. This includes $66.5 billion in discretionary resources and $86.1 billion in mandatory funding. FHCA's national affiliate, American Health Care Association/National Center for Assisted Living (AHCA/NCAL) issued a statement from President and CEO Mark Parkinson in response to the President’s FY 2014 budget proposal. At the halfway mark, more than 150 long term care providers joined FHCA to urge legislators to take the Senate budget position and restore much-needed Medicaid funding for high-quality long term care. This week, both the House and Senate Appropriations Committees met and passed their respective budgets. The Senate budget provides full funding for nursing facility care as available under current law. The House budget reduces nursing facility funding by approximately 2 percent or $45.6 million (a removal of the inflation that is available under current law and retaining the 2012-2013 average nursing home rate). Since 2008, the Legislature has reduced nursing facility Medicaid rates by nearly $700 million, causing long term care providers to struggle with operating costs, such as skilled labor and the increased use of medical technologies, which exceed Medicaid reimbursements. Facilities are losing an average $22.81 per patient per day, or $550,000 each year as a result of chronic Medicaid underfunding. “With 60 percent of nursing facility residents relying on Medicaid as their health care safety net, adequate Medicaid funding is critical to ensuring our state’s seniors continue to have access to quality long term care services,” said Emmett Reed, FHCA Executive Director. As lawmakers prepare to work out their differences on their respective budgets, FHCA is asking them to take the Senate’s position in the budget conference to help restore much-needed Medicaid funding for nursing facility care.